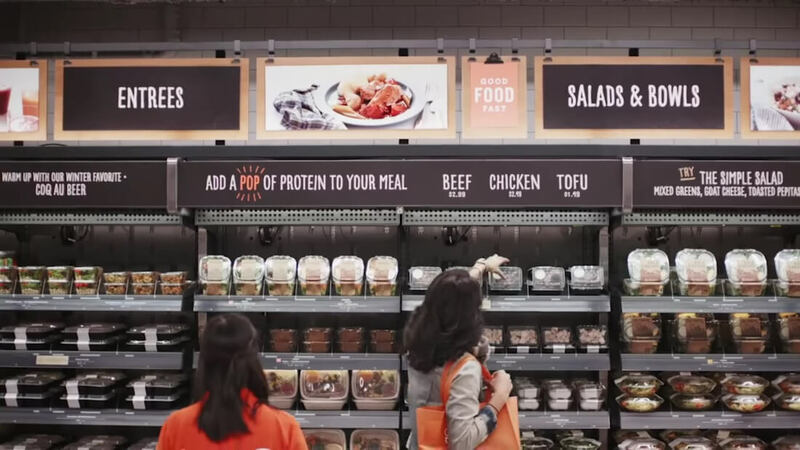 After more than a year of testing and a major delay, Amazon is finally opening its cashier-free grocery store to the general public tomorrow. ‘Amazon Go’ promises no lines, checkouts, or registers thanks to its “Just Walk Out technology,” which allows shoppers to pick up items from the shelves and leave. Amazon unveiled the shopping experience in late 2016, but only select company employees could use the 1800 square-foot store in Seattle during the long beta phase. Shoppers simply need to open the Amazon Go app on their phone and scan a QR code on the entry turnstile, at which point the store’s electronic arm barriers open. Anything that is picked up off a shelf is added to a virtual cart. Don't worry about changing your mind: it’ll be removed from the cart should it be replaced. Once a person leaves the premises, the total price of the goods is charged to their associated Amazon account; they’ll also receive a receipt. The technology uses a combination of machine learning, computer vision, deep learning algorithms and sensor fusion that Amazon says is similar to what you’d find in self-driving cars. The store was supposed to open to the public in March last year but Amazon decided to delay this timeline. The system reportedly had trouble tracking everything once there were more than 20 people in a store. It also struggled to monitor some items when they were moved from their designated spots on a shelf. But Amazon insists the delay was due to excessive demand from its own employees. Tomorrow morning will see the store finally open its doors to everyone. The company says Amazon Go is a limited test, but it’ll be interesting to see if the technology starts appearing in Whole Foods, the organic-food store chain Amazon acquired for $13.7 billion in June last year. Amazon said it will still hire staff to stock shelves and make prepared items in its stores, but, as is always the case with new forms of automation, there are fears the technology could lead to job losses for some of the near 1 million people working as grocery store cashiers in the US.